I guarantee you a big market fall. @skyfall wrote: Can you please explain me why Indian rupee keeps falling against USD. Is that a reason of Ranil. Also also explain how we gonna pay back massive loan which previous government took to build some white elephants and also unnecessary projects? Indian Rupee has remained strong & steady for long years and may be faced with decline at the moment. But SLR has been sliding all the time. Here comes Maharaja part two. Pretty much all 3rd world countries currencies are sliding against USD to boost their exports. Our case is worse cause of this mammoth debt traps thanks to the king. Here comes ruwan326 part two. Leave alone the prevailing situ. SLR has been steadily sliding over past few years. Our case will always be worse owing to the massive bond scam lead by tie coat wearing thief and a bunch of rob bers. Thanks to the Goo Governance! Now the reasoning given is sliding SLR is to boost exports. This is a big joke! India's case it may be. But in our case the benefits would be minimal owing to value addition to exports are imported. Let's wait and see how the exports are going to get boosted. The country's economy is screwed and share market will hit rock bottom next year. Hahaha Samaritan. Go and figure out the sliding of Indian rupee in last few years by yourself before open your genius mouth. King spent far too much money in non cash generating projects. Someone (all Srilankans except the elite) has pay it back. No surprise there to see the SL rupee sliding. @samaritan wrote: There are allegations that manipulations took place at the CSE under the former regime. As far as stock market manipulations and insider tradings are concerned, there are cases that can be cited even in countries like the USA & Australia. Raj Rajaratnam(USA), Former Bond Corp boss in Australia. If more search is done there are several cases that can be unearthed all around the world. Can anyone cite a single case in any part of the world where a nation's Central Bank had been robbed with the connivance of the VIPs of the ruling Govt????????? As i have stated earlier the scam can be compared to a massive earth quake (9+ on richter scale) in the country's financial system, the effects of which will be felt for long years to come. Sad plight! Ha Ha Haa Skyfall, Who pays for this?????? TRADE GAP WIDENS IN JUNE AS IMPORTS CONTINUE TO OUTSPACE EXPORTS! (Mirror Business of today). In the backdrop of a falling rupee!!! @skyfall wrote: Hahaha Samaritan. Go and figure out the sliding of Indian rupee in last few years by yourself before open your genius mouth. I agree with Skyfall about non-cash generating projects. A big problem for nation. Last regime was bad but this is worse. Problem is this government did zero work. They only sold all assets and spend for day to day expenses, took more loans (borrowings for the 4 years > last regime total borrowing), and put full blame on others for everything. Zero investments & FDIs and stopped all investments like port city for 2 years. No control over any public function like transport, medical or postal depts. Zero political stability - Highly unstable government. Bond market historic outflows, CSE continous f.outflows, rupee running towards 200/-, interest rates closing 30% aer by 2019 middle. I can continue but waste of time. I expect big taxes from budget targeting all sectors. You agree last regime borrowings was a big problem for nation?? It's a shame that none of the governments since independence had tried to trim down the government sector jobs. It's a burden to the nation. What the government earns not enough to cover even the expenses let alone debt repayment. Whoever comes to power tomorrow has to get bigger loans to cover their asses. The central bank robbers are trying to hide the economic crisis by using EPF money to stop index falling. When everyone is trying to sell the stocks government is going to buy. Why ?? Because no one else will buy at CSE for next 15 months. Wish the market turns bullish at least now. Are you a human being?????? King's time also market hit 4100. @skyfall wrote: King's time also market hit 4100. Try to understand - Everyone who has big accounts are finding buyers to exit the portfolios. Foreigners are struggling to clear accounts. But no one wants to buy because 98% of company performance is declining. (except exporting companies). Country's economy is collapsing. Whats the solution ? Putting epf money to this crashing stock market and loosing tax payer money. It will not stop the market decline. eg: JKH Main shareholder wants to sell stake. EPF not big even to buy 20% of that stake. Is there any Majic show going to happen after 15 months?? Maharaja was appointed by Mara Raja to spread what ever negativity to bring down the market. This is the typical kind of Kings Followers they do not mind if the country rot and burns down in the hell. What they need to do is save MARA from burning in scandals. @Maharaja wrote: Try to understand - Everyone who has big accounts are finding buyers to exit the portfolios. You are telling JKH main stake holder wants to sell and EPF is not enough to buy 20% of that...… This is a lie. Its very hard when you dont have proper knowledge. Each time like children you cry. A fund cannot invest like retailers invest. There are rules and committee guidelines. Khazanah holds 10% + of jkh /19.5 Bn, epf cannot buy such big stake unless their portfolio rules change. epf Fund value means - epf market cap. and not cash at hand. Learn the difference. I know EPF is not going to put all their monies into market. But As I know they have setup guidelines now.. I am not aware what is the cap for Share market investments. But this action will definitely bring life to market. My problem is you always not looking at the positive side but only negative side. Pls. let me know few positive side of this market. C.B Governor is only a puppet. I can prove my prediction clearly. Now he is saying epf is already buying bonds again. Did bond market rise ? No its falling daily. Daily foreign outflow is rising. Result is taxpayer money used to reduce bond market crash. But they are failing to stop outflows from bond market ! Only result is epf looses money which can be invested more profitably. Same story to CSE now. @Maharaja wrote: C.B Governor is only a puppet. I can prove my prediction clearly. Maharaja I think you don't have any shares in your portfolio, as you have asked forum members to sell you would have sold all your portfolio before any body else., so why are you wasting your time here, why don't you come back in 2020. 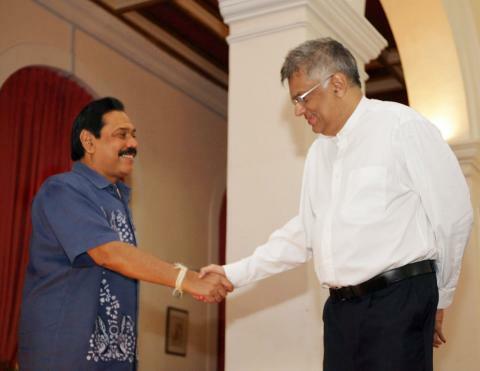 I have my doubts you are doing a contract of Basil Rajapaksa, how much he is paying for this. We are Here to earn some money not like you to promote any politician or any political party. Even mara has used E.P.F Fund to boost the market during his regim. few positive moves in economy..
Lankan rupee depreciation ratio for the year against USD is lower than of other Asian Peers. What else you need.. we are on the right track. But Factually we cannot show Majic..
President has at last realized that the UNP hierarchy in order to victimize certain individuals & Listed Companies in the pretext of maintaining highest level of discipline in the stock market caused panic, confusion and uncertainties at the outset to scare away the investors and on the other hand meticulously planned and executed the Central Bank Robbery. Hope there may be more unforeseeable actions that may benefit the CSE. according to above positive factors in SL economy,Why foreign still away from our market?I heard month of June nett foreign inflow was USD 300000.
crash landing Talks will be over soon..
EPF and ETF holding 2300 Billions. think Interest 10% then easily making 150 Billions. EPF invest around 50 Billions in stock market. then ASPI will move to 7000 level easily. when EPF investing. then Local Funds and individual Money will come also. Bond and Bill rates are falling now. One year Bill rate is 8.99 now. rates falling. that means Value of Bonds are going up. if you dont understand the subject then dont speak. how much foreign holding in Rupee Bond. that is less-than 5 Percent. Maharaja 2011 di Gran gaththe 232 ta. JKH gaththe 304 ta sold around 190 level. As an investor/trader you need to find all the opportunities to make better investment and trading to make profits. I guess you mis quoted foreing inflow to outflow.. Anyways… As I see only reason for this should be political uncertainity.. The ones like Maharaja is fueling the same by posting most unethically biased comments. AS what I believe when a government is elected the opposition should be give them support to rule the country but in our country what happens is that opposition doesn't allow government to do their work obstructing each and every possible way. Some idiots jump and laugh at Maharaja now thinking market turned. Market has not turned only foreigners selling and locals buying thinking epf can slow the market crash. Yesterday jkh crossings -all sold by foreigners. ASI will hit 5800 as predicted. Most important thing is. Money Inflow to Market. if Money Inflow then we no need to worry about who is holding it. Local or Foreign. Cash Inflow is Key factor. another 50-80 Billions Inflow to CSE. then ASPI move to 7000 level at least. මහරාජ මහතා හුගක් වැදගත් විදියට අපිට උපදෙස් දුන්න.බොහොමත් ස්තුතියි.දේශපාලනය නැතුව ඔබතුමා කටයුතු කරනවනම් හුගක් වටිනව.දේශිය හෝ විදේශිය මිළට ගැනුම් සහ විකුනුම් වලින් කොටස් වෙළද පොළ පවතින බව අපි කවුරුත් දන්නවනෙ.ගිය වසරෙත් අවසානයට පෙර(සි0ගර් ගනු දෙනුවට පෙර )විදේශිය මිළට ගැනුම් තිබුන.ඒ දවස්වල අපේ කට්ටිය විකුනුව.හැමෝම අඩු මිළට විකුනන්න කැමති නැති නිස මටනම් හිතෙන්නෙ ඉටිෆ් එකත් එන හින්ද ල0කාවෙ ආයොජකයො කොටස් මිළදි ගනී කියලයි.කොහොමත් ල0කාව ටිකෙන් ටික ඉදිරියට යනව කියල පේන නිස 2020දි විකුනන්න හරි දැන් ගත්තොත් අයොජකයින්ට යහපත් කියලයි හිතෙන්නෙ.ඔබගෙ දායකත්වය ඉතා වැදගත් අපිව දිගටම දැනුවත් කරන්න.ස්තුතියි. @stockback wrote: Maharaja 2011 di Gran gaththe 232 ta. this is different maharaja. Appachi Maharaja. Sorry not clear to me. Anyway if you don't want to give a clear direct answer, just forget my query. I will explain at right time. I think it's too early to explain this and promote it.